King K. Rool for Super Smash Bros. This is how I imagine King K. Rool (from the Donkey Kong Country series) would be if he were in Super Smash Bros. I’ve got at least a couple more of these on the way, so if readers are interested then they’ll have more to look forward to. 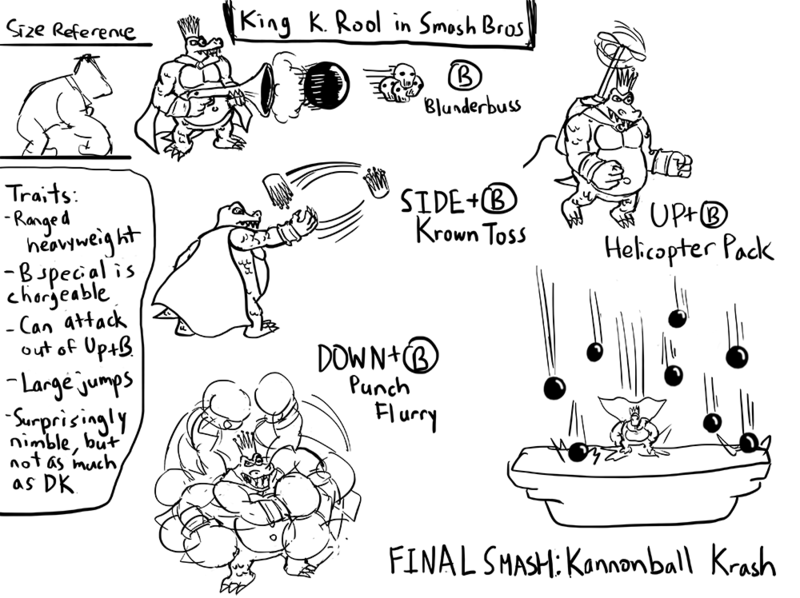 For King K. Rool, I made it so that each of his special moves references a different game in the Donkey Kong games produced by Rare, so Krown Toss = DKC, Blunderbuss = DKC2, Helicopter Pack = DKC3, and Punch Flurry = DK64. I’ve seen lots of other people come up with similar ideas, but what can I say? It makes complete sense. While King K. Rool is much larger than Donkey Kong in a lot of the games, I wanted to make them roughly equal in size so that it comes across as more of a rivalry between two powerhouses, as opposed to the David vs. Goliath feeling of Mario vs. DK or Mario vs. Bowser. K. Rool is not quite as strong or as quick as DK, and his movements are a bit awkward, but makes up for it with some nice ranged attacks. Krown Toss is for space control and bits of damage, while the Blunderbuss is for KO power. The longer you charge the Blunderbuss, the more (randomized) projectiles it shoots out. Helicopter Pack is highly controllable but very slow and thus an easy target for edgeguarding, while Punch Flurry is good for clearing crowds but exhausts K. Rool afterwards. He doesn’t actually punch all that much in DK64 but I figured having yet another ground pound character would be overdoing it. His Final Smash is based on the giant leaps he takes in DKC; I imagine it being fairly similar to PK Starstorm only that K. Rool himself is also a “projectile” in this case. Of course, he would have his running attack from the first DKC. This entry was posted in art, smash bros, thought exercise, video games and tagged donkey kong, donkey kong country, king k. rool, smash bros 4, tablet. Bookmark the permalink.